The E-Mei Mountain is in Sichuan province, in Central China. This inaccessible area was a favourite hiding spot for revolutionaries and rebels, deposed Generals and would-be future Emperors, often referred to as Tigers and Dragons, who retreated to the mountains, preparing their campaigns against the regimes they planned to overthrow. The 12 Daoyin of the E-Mei are a traditional Buddhist exercise system. About 1000 years ago a monk named Rei Yun devised this highly effective exercise system, both to train those who fought against the ruling Emperor's army and for bone setters, who used the powerful Daoyin to improve their skills in treating the injuries suffered in combat. E-Mei is the name of the mountain where this Qi Gong health system was created. In order to understand the words "Qi Gong," one must grasp the concept woven into its two roots, Qi and Gong. Qi is written with the character that indicates the cooking and steaming of rice, and it is usually used to mean "air," "breath," or even "steam." But, this is only the outer, external breath. The word Qi is used by practitioners of Qi Gong and the martial arts to mean "internal prana," life force, or biopsychic internal energy. The canons of traditional Chinese medicine teach that life and health are a result of the harmonious flow of ample Qi throughout the body. When Qi Gong exercises are said to cultivate Qi, it is this internal Qi that they cultivate. All disease is thought to stem from a disruption in the smooth flow of this internal Qi. Acupuncture is based upon the belief that Qi circulates throughout the body along twelve major meridians, stimulation of which can cure various ailments. The exercises are an excellent way to develop physical strength and stamina and thus are very well suited to martial artists. However, the tonifying effect of the exercises means that they can be used to improve health and even to treat some diseases. The powerful force developed during the practice of the E-Mei Daoyin is also very useful for health and body-work, such as massage, etc. E-Mei Qigong contains very precise and detailed movements that really enhance the ability of the mind and QI to permeate the body and move throught the joints, creating very strong Force. E-Mei can be considered to be a significant contributor to the origins of Taiji, Taijiwuxigong and other Qigong Forms. For optimum results, one needs to pay attention to develop the exercises one by one, and each individual exercise stage by stage. Then it is possible to open the body's energy channels and meridians, enabling the practitioner not only to achieve a high level of physical energy but also to develop to a high level of the Chan (Zen) meditation system on the mental plane. The only written material about the E-Mei Daoyin was in the form of ancient poetry, written in such complex and ancient language that very few people could grasp the meaning of the poems and thus clearly understand and express their ideas. However, in the 1950's, TCM Dr. Zhou Qianchuan published a book in which he clearly explained the elements of some of the poetry in relation to the subject. He also taught the E-Mei system in Beijing and Shanghai. 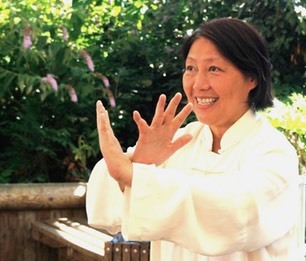 This weekend offers a complete E-Mei Daoyin exercise, the Heart Daoyin, which can be practiced independently of the other E-Mei exercises, while each Daoyin develops different aspects of mind, body and spirit and can be studied in it's own right. Tea is provided, but you must bring your own lunch or go out, there are many pubs and cafes within walking distance. EARLYBIRD Discount £60/day £35/session if paid in full before 1st September. It is recommended that you book and pay in advance to secure your place. If the Workshop is fully booked in advance notice will be posted on the website.